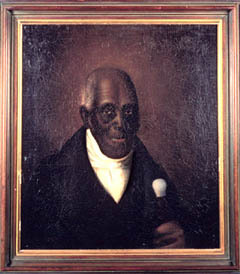 click image for close-up The portrait of Agrippa Hull, a freeborn black man and Revolutionary War veteran who lived in Stockbridge, Massachusetts, hangs in the historical room of the town library. Hull was 85 years old when his image was captured. Painted in oil in 1848 by an unknown artist, the portrait is a copy of a daguerreotype done by Anson Clark in 1844.